When investors get nervous about the state of the economy, consumer staples tend to do well. We pointed this out a few weeks ago, highlighting a number of well-performing consumer staples stocks. The same is true of utility stocks. When fears of economic slowdown come to the fore, utility names tend to do well. Why does this happen? Partly because, as fears of slowdown rise, growth stocks fall out of favor. This spurs investors to rotate their capital out of high-flying, high-valuation growth stocks and into stodgier, safer names — like utilities. Jim Cramer, the high-volume financial personality on CNBC, reports that corporate CEOs are privately worried. Cramer is more of a psychology barometer than an information source. His thinking represents the view of the retail investment public (while also directly influencing that view). But wholly aside from anecdotes, we can directly confirm slowdown worries have surged by comparing utility stocks with homebuilder stocks. The two industries sit at opposite ends of the sentiment spectrum: While utilities serve as a proxy for economic pessimism, homebuilders are a proxy for economic optimism. Lately the outperformance of utilities versus homebuilders has skyrocketed. This is clear indication that the pessimists are getting a leg up on the optimists. You can see this in the relative performance of XLU, the utilities SPDR, versus ITB, the iShares homebuilder ETF. 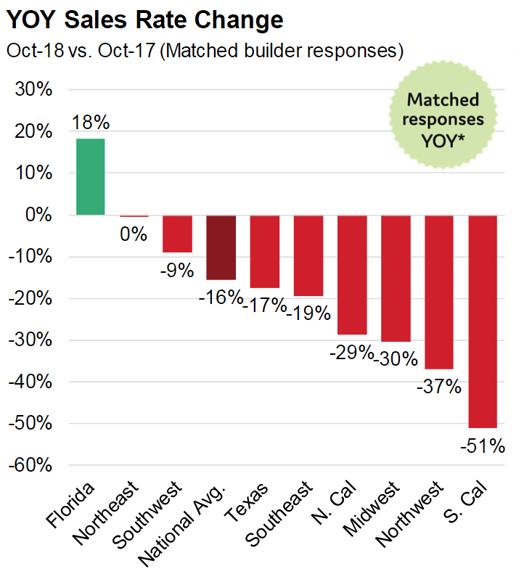 Utilities saw a near-vertical rise compared to homebuilders in October, as the chart shows below. This is not so much a “wall of worry” as a surge or spike of worry. Via John Burns Real Estate consulting, we can also see that the year-on-year rate of home sales is falling. The national average year-on-year decline is 16%, but in multiple regions of the country it is far worse. If the housing market has indeed turned, we will see more data points like this — which could add to investor anxiety. To sum up, a slowdown in the housing market has investors concerned. Coupled with CEO worries over signs of softness in the business outlook — and the threat of rising interest rates — investors are herding toward the relative safety of consumer staples and utilities. But which utility names are worth considering? Some of them have big problems. Take PG&E Corp for example (symbol PCG), the biggest utility in California. PG&E shares saw a huge drop this week, losing more than 64% at their worst point, due to fears of liability exposure in the midst of devastating wildfires. If PG&E equipment played a role in the Camp fire — the worst wildfire in California history — the financial fallout could be far greater than the company’s $1.4 billion worth of catastrophic insurance coverage. When PG&E reported the possibility of exposure far in excess of insurance coverage, the stock plummeted. As of this writing, the stock price is gyrating wildly in response to regulator comments, as investors try to game whether California’s largest utility faces a true bankruptcy threat. California aside, though, most publicly traded utilities do not face such life-or-death issues. Under normal circumstances the utility business is boringly reliable and predictable (as homes and businesses will always need power). Utilities are also preparing for the 21st century — a late start, but better late than never — with increasing levels of alternative energy investment to upgrade their power grids. 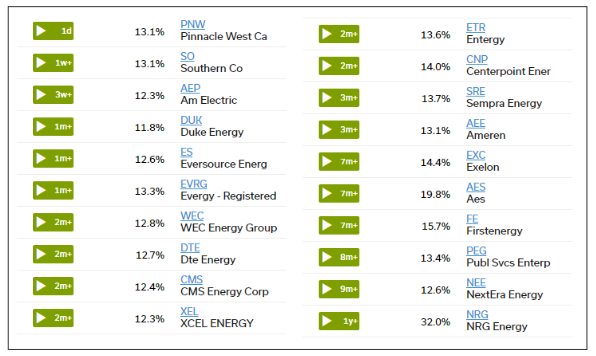 Below are twenty utility plays with a healthy green zone rating for their stock state indicator (SSI) status. These names could see further price appreciation if economic slowdown worries — and investor rotation out of growth names — persists in the months ahead.